The MAKO® 284 CC is a perfect predator, whether you're hunting marlin in the Gulf Stream or mahi in the kelp paddies. Powered by up to 700 horses and with a 228-gal. fuel capacity, it's got the range and speed to get you out farther and keep you out longer. The 284 CC is well-equipped to fish, with aft in-deck port and starboard 290-qt. 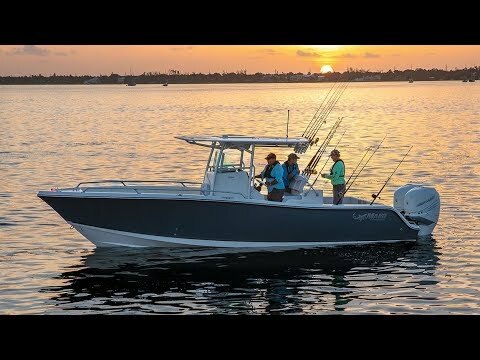 fishboxes, and outrigger-ready fiberglass hardtop and a full-featured baitstation. And the quality of construction (100% composite) is unparalleled—the hull and deck are chemically bonded and mechanically fastened every 6" with stainless steel fasteners. The 1-piece, molded, gelcoated stringer grid reinforces the hull for a lifetime of fine performance. And it's backed by MAKO Assurance 5+Life—the best factory warranty in the business. Max. person weight: 5490 lbs. Max. person, motor & gear weight: 5791 lbs. Average hull weight: 6000 lbs. Average package weight: 9800 lbs. Package height w/T-top or hardtop: 12' 4"
15" (38.1 cm) radial tires w/galvanized V5 wheels.